Your radiator plays an important role in your vehicle’s heating and cooling system. If it isn’t functioning properly, your vehicle is in danger of overheating, which can lead to mechanical failure and other issues. #1 – Look for abnormal rises in your thermostat. It’s necessary to maintain a certain temperature to continue driving safely and avoid serious damage. Owners should pay close attention to quick and abnormal rises in their vehicle’s thermostat readings. Do not ignore any extreme heating or wait until steam is rising from under the hood to take action. #2 – Inspect for rust/leaking. Careful inspection of your radiator will reveal any rusting or leaking that will cause your vehicle to break down. #3 – Pay attention to driving habits. Your driving habits, the age of your vehicle, and the weather conditions in which you drive are contributing factors to radiator breakdowns. #4 – Pay attention to engine temperature. Your vehicle’s engine can either run too cold or too hot, which can lead to expensive repairs. When the engine’s too cold the catalytic converter may be damaged, and when it runs too hot, your vehicle might suffer a cracked head gasket. This leads to coolant leakage or combustion gas leakage to various engine components. There are many causes of radiator malfunction. Age and normal wear and tear can cause major problems if left unchecked. Our routine maintenance to your radiator prevents engine overheating or engine breakdown. The primary goal of any radiator service is to keep you off the side of the road. One of the best tips for proper radiator maintenance is to drain the coolant. Whenever coolant becomes old, it becomes ineffective at causing the radiator to cool the engine..
At USA Automotive, our team of radiator repair specialists have the equipment and expertise to keep your radiator at peak performance. Located in the heart of the 27604 area of Raleigh, NC, our radiator or replacements are a better alternative to any area dealers. We treat you like family, and at our repair facility you’re not just another number. With an industry-leading service guarantee, you can be rest assured that you’ve received the best radiator repair services in the area. Contact us for a FREE quote on radiator repair in Raleigh! 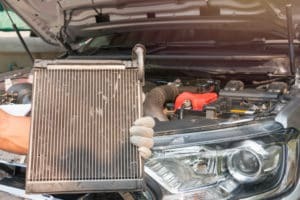 Schedule Your Radiator Repair Today! 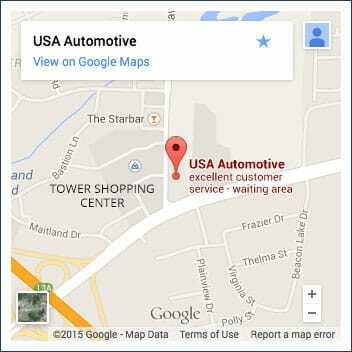 At USA Automotive we are here to provide you with the best radiator repair services in Raleigh. We help you maintain an appropriate temperature for your vehicle by servicing all components to your vehicle’s cooling system. If you’re noticing an extreme uptick in your vehicle temperature, then stop by our shop, located at 1620 Trawick Rd., Raleigh, NC 27604. We’ll make sure you avoid breakdowns from overheating today, tomorrow, and the foreseeable future. Give us a call today at 919-249-5295, or pick a time and day that works best for you right now, and schedule your appointment by using our convenient online scheduling system.